Today was one of those days where you feel blessed to be in a place like Guadalupe Island. Just us and the wild in its maximum manifestation. The conditions are stunning, visibility must be at least 40 meters, I mean, when you can see the anchor chain going down or sharks swimming around the bow in a crystal clear blue water, it is amazing! On top of that at least 10 different sharks have been around constantly all day long, just checking out the boat or giving breaches to get the bait. The big females are making their presence but also younger sharks are still around, and that gives the comparison terms you need to understand how big a great white can be! Seeing the guests happy is the plus that makes this perfect! I’ve discovered that, beyond having the opportunity to see one of the most wonderful creatures in the world and spend time admiring them, there is also great joy in seeing our friends that come from far away make their dreams come true or overcome their deepest fears. There are no words needed, their faces express everything they feel. It is greatly satisfying to be a part of the team that helps them in one way or another. Today we had one of the best days of shark action all week. Many sharks were going for the bait at the surface and at least 10 different sharks were around the cages! They were coming and going from different sides and getting very close to the cages. It was awesome! We identified “Slashfin,” “Ropey,” “Rhett” and “Andy.” The visibility was 30+meters and the sun was shining and the water were super calm. It was a perfect day to be at Guadalupe Island. A great white swims between the Nautilus cages. It is time to leave Guadalupe Island and on the way back I cannot forget how amazing this trip has been shark-wise. We had two days of intense action, packed with sharks, with three all the time around the cages and peaking at 6 sharks for hours. The last day another big female showed up, called “Scarboard,” and was cruising along with “Lucy,” our massive 14ft female shark. Visibility was 120ft and beyond, with no current and bright sunshine. On the last day, a massive school of yellowfin tunas passed by, with more than 50 individuals hunting the mackerels.We are finishing this trip with a trivia night! Here we go!! 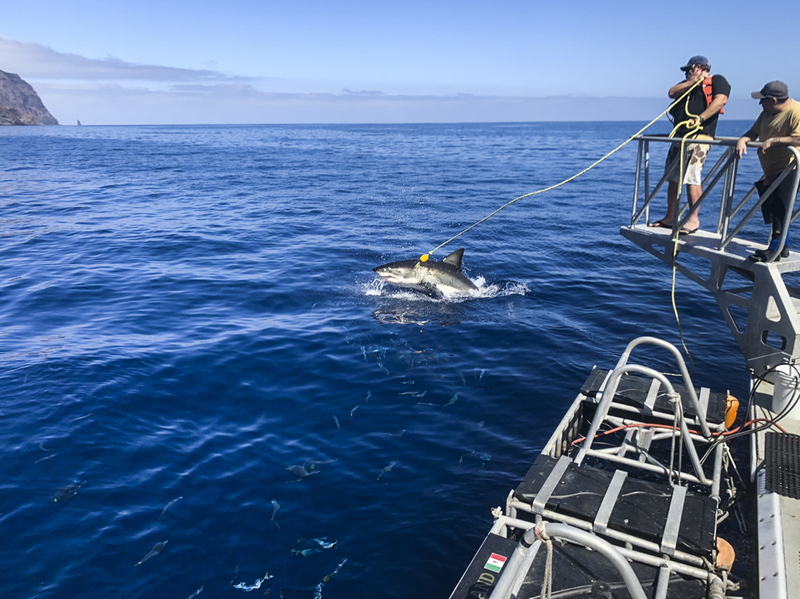 Once again we are on the way to Guadalupe Island, where our sharky friends are waiting for us! I cannot wait to be with those great whites again, they are so amazing! Looking forward to a wonderful trip! Today was a really exciting day. We saw many different female great white sharks. 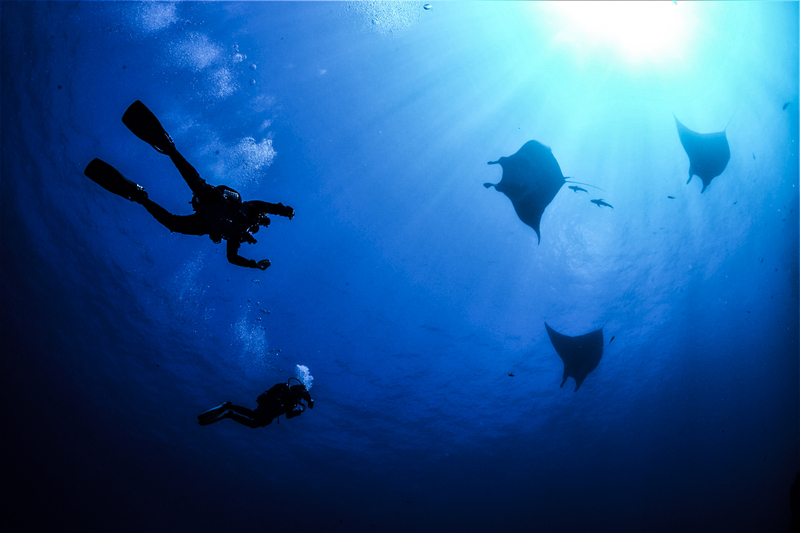 It is really incredible to watch them swimming around the cages, mesmerizing the happy divers. The guests don’t want to get out of the cages! We are happy to see their smiling faces. Thanks to all sharks for this wonderful dive!! Another great day on the Nautilus Belle Amie! 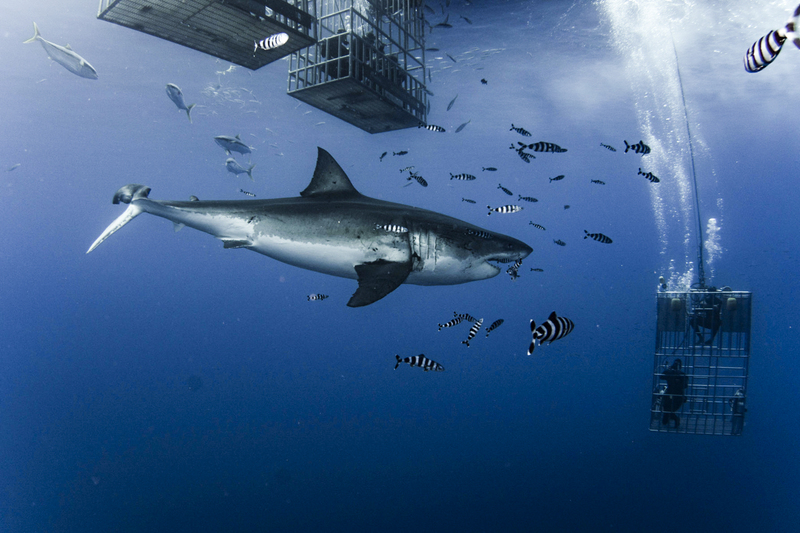 The guests are happy and the sharks were incredible, swimming very close (face-to-face) to the cages. Happy divers mean all our hard work is worth it! A partial shark breach off the back deck! Now that it is October, it is time for big females! We have had more female great whites show up on this trip, including a young female who is missing half her caudal fin. 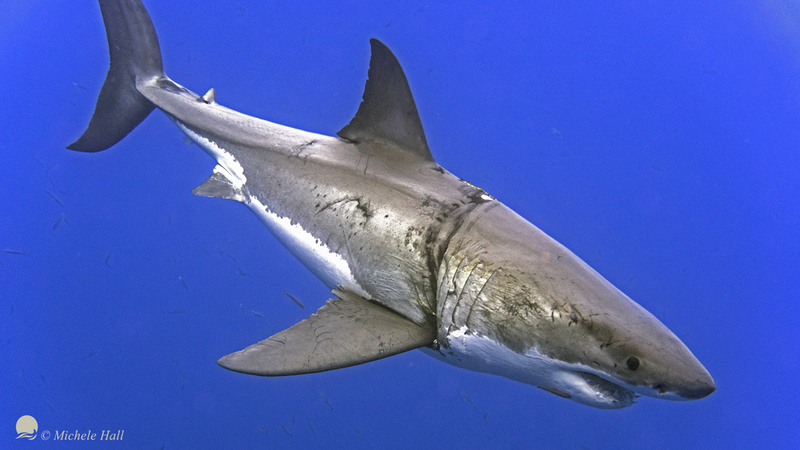 We were able to identify her thanks to our guests who participated with their pictures in our Shark ID program, using the White Sharks of Guadalupe Island identification guide. Shark ID is conducted after every day of diving during our cocktail hour. This particular shark is a female with no name but the number #253. Today the tuna schooling was awesome, hunting for mackerels around the tuna bait. They are very majestic and accurate in their attacks. The visibility has been great at 120ft and water temperature is around 21°C, although it is kind of chilly on the surface due to a cold wind, which means the climate is changing! If you planning to come down this month or next month, don’t forget to bring a jacket. This is just the beginning of the trip, lets see how it goes tomorrow! I’m pretty sure will be awesome again. 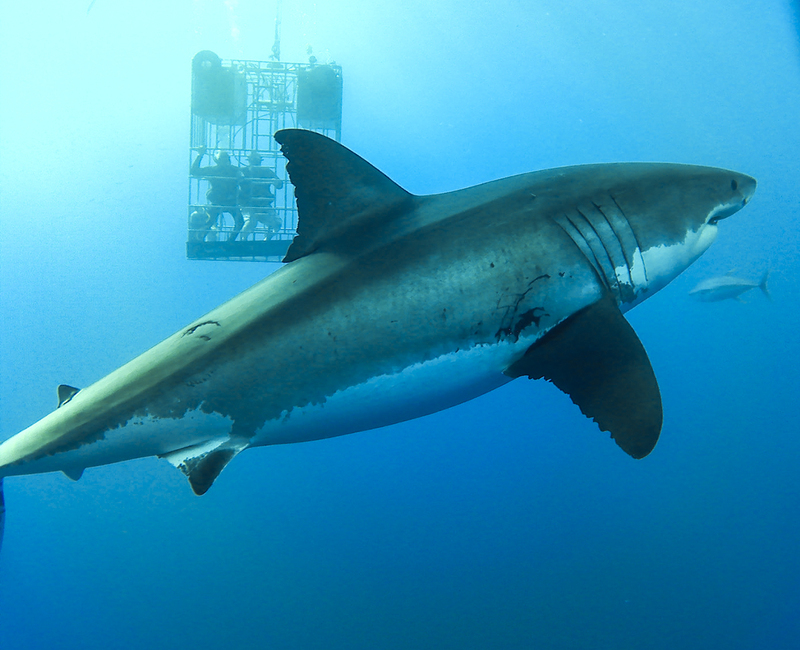 What a great day at Guadalupe Island! We got a little bit of rain throughout the day and some mild winds, but that didn’t stop us from diving with some of the biggest great white sharks on the planet. The visibility was still over 100ft+ we had over 5 sharks for the whole day and there was nonstop action in the surface cages. I can’t wait for tomorrow! What a first couple of days to the trip! It was a bit windy yesterday but it was still flat with 120ft visibility! Many large sharks, the big females, are starting to arrive, with several individuals at 13ft plus and some as large as 15ft! Today there was no wind at all and almost not a ripple on the ocean until the sharks were breaching and thrashing at the tuna! At times there were as many as 6 individuals at once! We had great conditions again today with 140ft visibility! Happy guests and happy guides tonight; we have a fun trivia quiz for everyone so lets see who is going to win these prizes! Today was amazing due the conditions: super clear sky, sunny, flat calm sea (like a lake) and, of course, the sharks. It was the perfect combination for a great dive day. We were surrounded by three sharks on all of the dives and the wrangling brought a big female to the surface, breaching out of the water and causing our guests to yell with happiness. 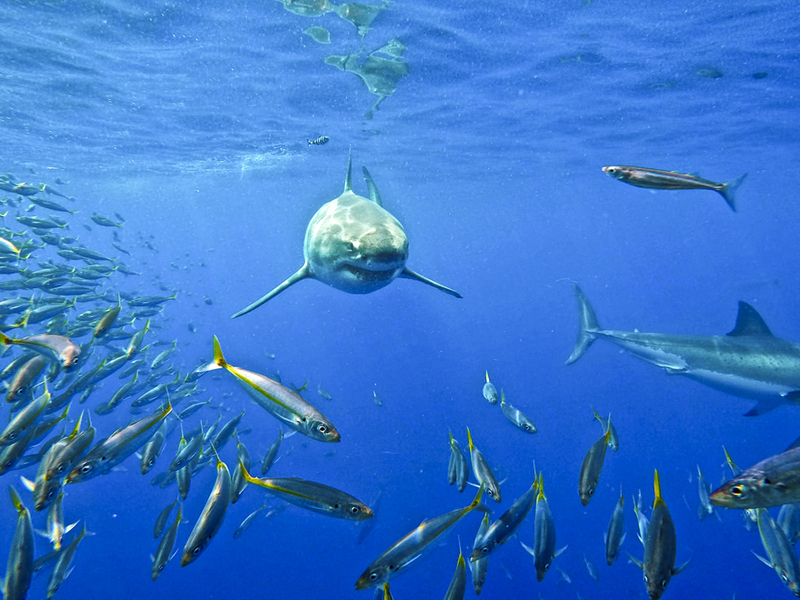 The visibility more than 150ft; you could see sharks coming up from the deep to ambush the bait. The water temperature is still 21°C , so you should be comfortable diving in a 7mm wetsuit. 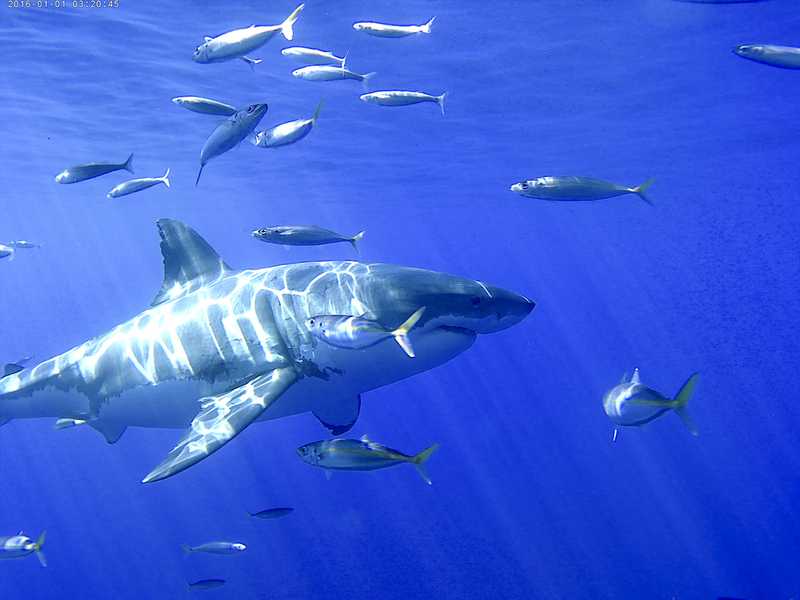 We are wrapping up another great trip to Guadalupe Island. Most of the guests are first-time cage divers and many got certified just to go in the submersible cages here on the Nautilus Belle Amie! The excitement has been top notch and the sharks have put on a spectacular show for us over the last three days of diving. The sharks showed up within minutes of the bait hitting the water every morning and stayed around all day long. Ten minutes did not pass where we didn’t see at least one shark, with up to five sharks at one time. 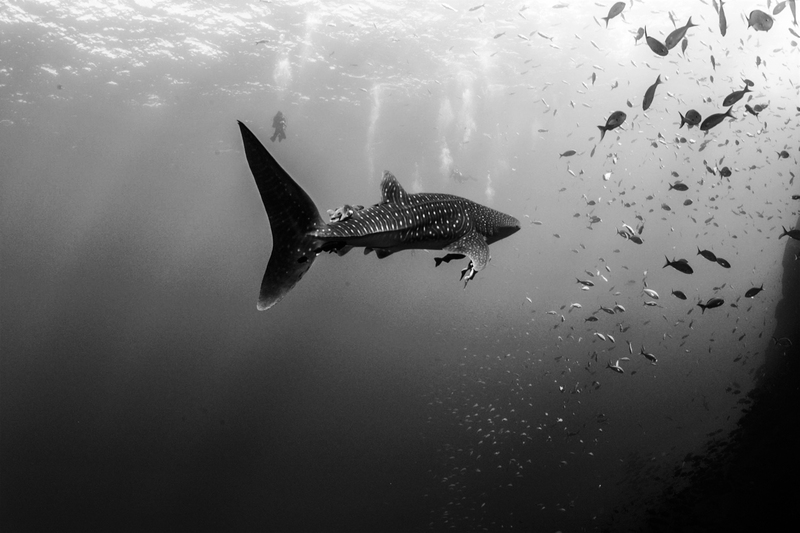 We saw mostly females, including some very large ones, up to fifteen feet in length. Water temperature is 21°C and the visibility is 120 ft+. The first day was pretty windy but the last two days were calm and glassy like a pond on a hot summer day. Now we are headed back to Ensenada for our next group, I can’t wait to see what the ocean holds on the next trip. We began this trip with a fantastic first dive day; there were sharks around the cages all day, with a final count of 7 different individuals. But the amazing part was that all day, and when I say all day mean from 6am until 6pm, we had the presence of one of the biggest females that has been identified at Guadalupe Island, “Lucy!” She is a 15ft great white that ran a complete show for our divers, passing in very slow motion around the cages, giving all divers and underwater photographers time to enjoy all day. From 6am to 3pm the show was even more spectacular because “Lucy” was sharing the stage with one of the most popular white sharks of the season, “Luca.” He is a male that has been around all season around with an intense energy, especially for hunting our tuna! Today was no exception, and he made the wrangling activity amazing with spectacular breaches. What a great way to start this trip, everybody is looking forward to the next couple days!